The Union Ultra FC that has roots from MC Metafuse. It’s an incredibly expensive binding that cost more than many boards out there. They took the Drug Dealers and Doctors price from the MC Metafuse and bumped it up even higher. It might now only be for Drug Dealers. Highback Flex: Super stiff when bending it back but more twist than you would think for how stiff it is. Boot Adjustability: You can dial out the Union FC to your boot rather well. It’s a little limited when it comes to high back rotation or ankle strap angle adjusting but the rest is pretty good. Stance Width Adjustability: Because it’s easy to center your boot on the binding you can turn the discs so the channels are going from tip to tail and get just about any stance width you want. Comfort: Very comfortable and the ankle strap is very well done. Ankle straps often are the center point of comfort and I noticed not a single pressure point. Usually, high backs like this bite into my calf like the Ultra’s do but the Union Ultra FC doesn’t seem to bother me as much. Boot Support: Very good boot support and the new ankle strap does a much better job of supporting your ankle. Turn Initiation: Super fast and it’s the fastest in the line for sure. Buttering: The buttering power is maybe a touch less than the Ultra or other mini disc bindings but still in that same general area that’s pretty easy. Ratchet System: Smooth and reliable. Shock Absorption: You pay a price for this much response and that is minimal shock absorption. 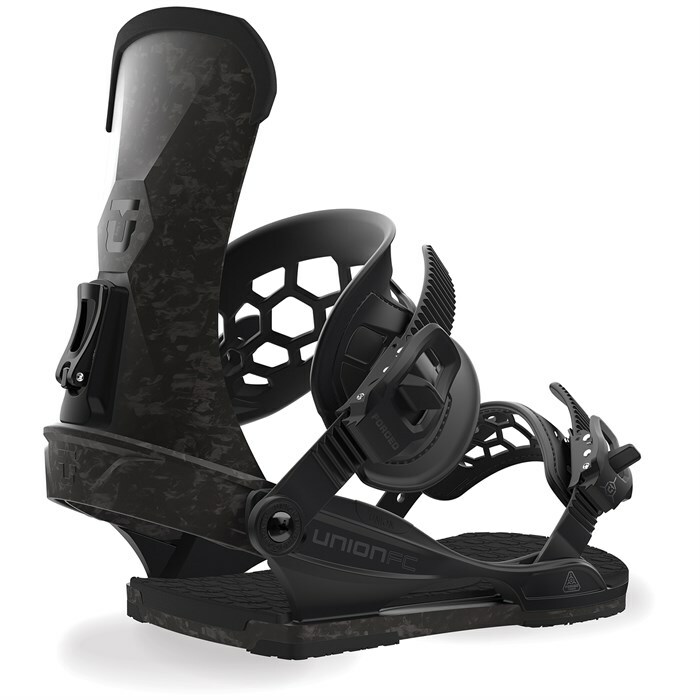 The Union Ultra FC is a super responsive binding that some might want to pay for but if it was my hard earned reviewing dollar coming out of my small wallet I would go Falcor. Flex: Feels medium stiff to borderline stiff. It doesn’t feel as stiff as the Chargers but it’s still pretty stiff. Especially for how thin the high back is. Adjustability: Unions toe and ankle straps now are both toolless. It really makes it easy to dial out the fit to your boots on the mountain as well as at home. Combined with the adjustable heel loop you have a pretty easy binding to dial out to your boots. The only thing I don’t like about these bindings when it comes to adjustability is the super light bolts that require an Allen wrench. I’ve broken a few in the past on the MC Metafuse and would rather have them weigh a little more and have normal Philips head screws instead. Comfort: Feels very comfortable. Especially so for how light it is. Turn Initiation: Very fast edge to edge. It made my moderately quick Jones mountain twin snap much quicker edge to edge. Buttering: Even with the tiny ankle straps, the minimal contact with the board made it pretty easy to butter and flex the board from tip to tail. Boot Support: The 2017 and 2018 Union FC has vastly improved when it comes to supporting. 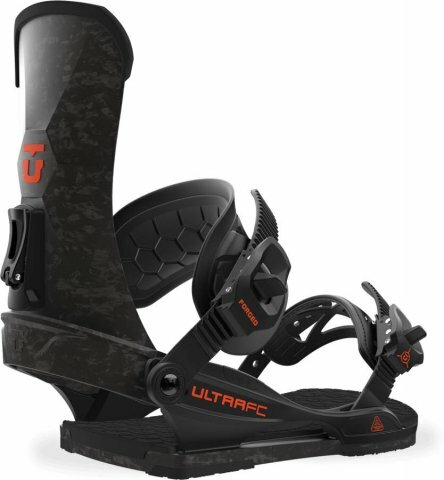 Depending on how you look at things It still has more ankle exposure or more freedom of movement than other bindings in its peer group along the industry but it’s way better than before and now it’s something that can handle days in the uneven messy snow. 2015-2016 Union FC– I feel like there is almost no support. It’s fine on clean groomers but when I hit really uneven snow I feel like it’s just my ankles, the board, and snow. I don’t have the confidence to go faster. I’m more into the bigger more supportive ankle straps and with these, I feel exposed. If I owned these I’d buy one of Union’s larger ankle straps from C3. I personally hope these smaller ankle straps don’t trickle down to the mid-level bindings or they always have the option to buy larger ankle straps. Of course, this is just my opinion and most of the riders on my site but I know some people who don’t contribute to the site that do like them so to each his own. Ratchet System: Unions ratchet system has improved the last 2 years and they are all really easy on and off now. Shock Absorption: There is more shock absorption with the Forged Carbon than there was with the MC Metafuse so nice improvement here. We try to get as many images of the Union Ultra FC, but forgive us if they're not all there.